There is no better place to get information about home sales than the Tallahassee Board Of Realtors Multiple Listing Service. The Leon County Tax Appraiser holds the data which contains all of the sale and property transfers in Tallahassee, and it is a wonderful resource. But the Tallahassee Board Of Realtors Multiple Listing Service contains most of the sales and most of the homes for sale in Tallahassee, which means we can examine the balance of supply and demand. It is this real estate supply and demand dynamic that best guides our forecasts, and this is why I so often write about "months of supply" in the Tallahassee real estate market. When we examine supply and demand in all the areas covered by the Tallahassee Board Of Realtors Multiple Listing Service, we find that things are slowly improving. In the real estate graph above, the green line shows the annual trend of home sales, the red line records the average number of homes for sale, while the purple line plots the current months of supply on the right axis. If we look at the left side of the graph, this is what "good" or "normal" is supposed to look like. Sales are far higher than listings, and the months of supply are around 6. Then demand begins to rise in 2004 for various reasons, and the supply train notices and follows suit. See how demand began to flatten in early 2005, but the supply side did not figure this out for several more years! So the additional building that occurred from 2005 through 2008 has over-built our market (roughly 14,500 too many homes were built during this period), and that is why our over-supply situation continues. So even though the supply side is dropping (yeah! ), the red line in the graph shows that it is still double the amount that we had before the boom of the housing market. Sadly, demand is no where near where it was prior to the run-up, and we know that it will take more time before it returns. 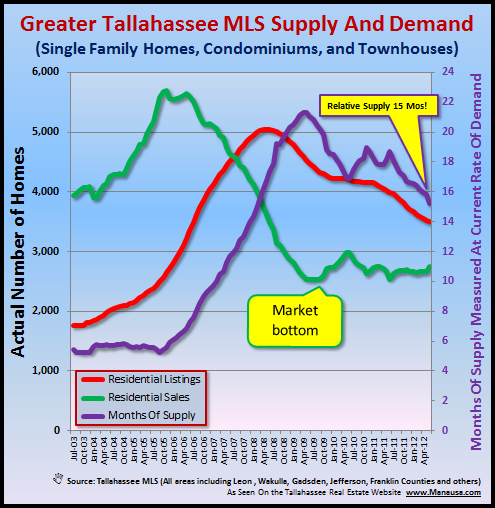 We continuously publish market information in order to help prevent this from happening again, and we hope that this vigilance will bring about equilibrium sooner to the Tallahassee real estate market. Our understanding of supply and demand in the Tallahassee Board Of Realtors Multiple Listing Service is the reason that our advice has been so effective at selling homes over the past five years. If you are thinking about selling your home or perhaps wondering what opportunities for selling your home and buying right now (to take advantage of sub 4% interest rates), you can drop me a note to schedule a time to discuss your specific situation and needs. We will review how your home compares to others in the Tallahassee Board Of Realtors Multiple Listing Service and give you the best advice for what you would like to accomplish.